Neil Warnock told Cardiff City players Emiliano Sala would have been proud of their performance after Bobby Reid scored twice in a 2-0 win over Bournemouth. 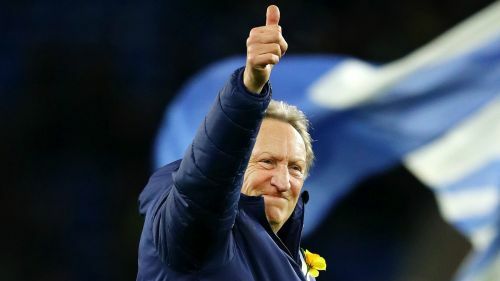 A visibly emotional Warnock walked around the pitch to celebrate with supporters at the end of the Bluebirds' first home game since new signing Emiliano Sala went missing when the plane he was on disappeared while crossing the English Channel on January 21. The result took Cardiff to within two points of 17th-placed Burnley in the Premier League and Warnock said his side got their reward for successive good performances in the narrow defeat to Arsenal and Saturday's triumph. "I thought they [the players] were amazing. I thought they were at Arsenal - I was disappointed we didn't win the other night. "We worked on the system and what we were going to do, and I thought it worked an absolute treat. "We knew they'd have a lot of possession, they've got some good players. They've got something like £86million worth of players on the bench - we had about three [£3m worth of players on the bench]!" Reid converted a penalty after five minutes following Steve Cook's handball in the box, and the former Bristol City forward struck again just 15 seconds into the second half to double Cardiff's lead. The 26-year-old's performance was a fitting tribute to Sala, and Warnock said the result would help the club move forward. "The attitude was fabulous, we played some good stuff, we broke well," said Warnock. "Now we can get on with the season and we've told the teams above us we're not going to give up without a fight. I'm proud to be the manager, definitely." Reid, who has made 11 Premier League starts this season and scored four goals, held aloft a jersey with Sala's picture on it after netting the opener, something he did for the striker's family. He added: "It was right to do so. We have had a tough few weeks and it was good to do that for him and the family."